Purpose To prospectively assess liver fibrosis with two-dimensional shear wave elastography (2D-SWE) in patients with chronic hepatitis B (CHB) and to compare the performance of this modality with that of serum indices using Scheuer scoring from liver biopsies as the reference standard. Materials and Methods 123 patients with CHB underwent 2D-SWE measurements and serological tests between April 2016 and February 2018. The 2D-SWE and serum indices in the diagnosis of liver fibrosis were assessed using receiver operating characteristic (ROC) analyses. Results The areas under ROC (AUCs) for 2D-SWE, aspartate transaminase-to-platelet ratio index, fibrosis index based on the four factors, Forns score, King’s score, FibroIndex, red cell distribution width-to-platelet ratio, Hepascore, type IV collagen, and hyaluronic acid were 0.851, 0.738, 0.701, 0.739, 0.734, 0.711, 0.692, 0.601, 0.640, and 0.522, respectively, in the diagnosis of substantial fibrosis, 0.975, 0.819, 0.792, 0.829, 0.818, 0.807, 0.732, 0.572, 0.676, and 0.544, respectively, in the diagnosis of severe fibrosis, and 0.972, 0.883, 0.862, 0.908, 0.889, 0.918, 0.808, 0.601, 0.807, and 0.775, respectively, in the diagnosis of cirrhosis. The AUCs of 2D-SWE in the diagnosis of substantial fibrosis, severe fibrosis, and cirrhosis were significantly higher than those of the serum indices (p < 0.05). Conclusion 2D-SWE is a reliable noninvasive method for the assessment of liver fibrosis in patients with CHB with better diagnostic performance than that of nine serum fibrosis indices. 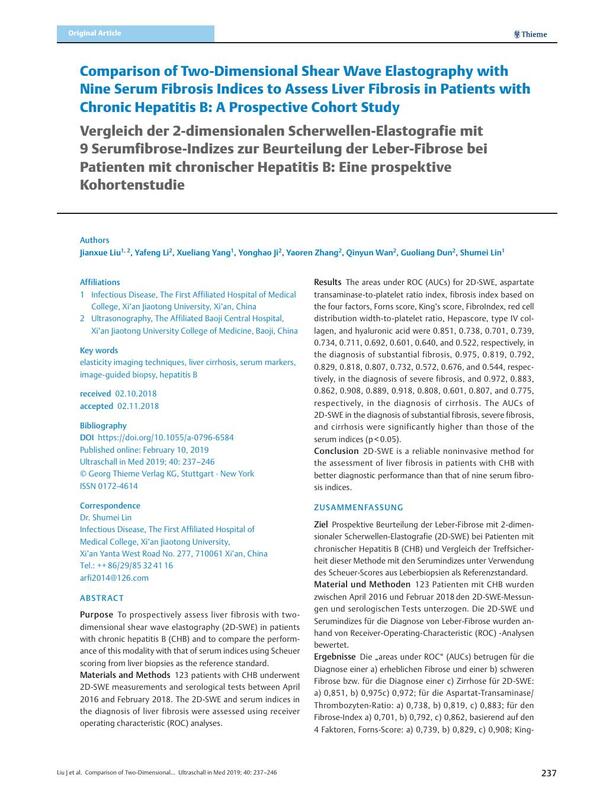 Ziel Prospektive Beurteilung der Leber-Fibrose mit 2-dimensionaler Scherwellen-Elastografie (2D-SWE) bei Patienten mit chronischer Hepatitis B (CHB) und Vergleich der Treffsicherheit dieser Methode mit den Serumindizes unter Verwendung des Scheuer-Scores aus Leberbiopsien als Referenzstandard. Material und Methoden 123 Patienten mit CHB wurden zwischen April 2016 und Februar 2018 den 2D-SWE-Messungen und serologischen Tests unterzogen. Die 2D-SWE und Serumindizes für die Diagnose von Leber-Fibrose wurden anhand von Receiver-Operating-Characteristic (ROC) -Analysen bewertet. Ergebnisse Die „areas under ROC“ (AUCs) betrugen für die Diagnose einer a) erheblichen Fibrose und einer b) schweren Fibrose bzw. für die Diagnose einer c) Zirrhose für 2D-SWE: a) 0,851, b) 0,975c) 0,972; für die Aspartat-Transaminase/Thrombozyten-Ratio: a) 0,738, b) 0,819, c) 0,883; für den Fibrose-Index a) 0,701, b) 0,792, c) 0,862, basierend auf den 4 Faktoren, Forns-Score: a) 0,739, b) 0,829, c) 0,908; King-Score: a) 0,734, b) 0,818, c) 0,889; FibroIndex: a) 0,711, b) 0,807, c) 0,918; Erythrozyten-Verteilungsbreite/Thrombozyten-Ratio: a) 0,692, b) 0,732, c) 0,808; für den Hepa-Score a) 0,601, b) 0,572, c) 0,601; für Typ-IV-Kollagen a) 0,640, b) 0,676, c) 0,807 und für Hyaluronsäure a) 0,522, b) 0,544, c) 0,775. Die AUCs der 2D-SWE bei der Diagnose von erheblicher Fibrose (a), schwerer Fibrose (b) und Zirrhose (c) waren signifikant höher als die der Serumindizes (p < 0,05). Schlussfolgerung 2D-SWE ist eine zuverlässige nichtinvasive Methode zur Beurteilung der Leber-Fibrose bei Patienten mit CHB und weist eine bessere diagnostische Leistung als die 9 Serum-Fibrose-Indizes auf. 36 Wang K, Lu X, Zhou H. et al. Deep learning Radiomics of shear wave elastography significantly improved diagnostic performance for assessing liver fibrosis in chronic hepatitis B: a prospective multicentre study. Gut 2018; DOI: 10.1136/gutjnl-2018-316204.